My last post featured a wide view of Canis Major. Here, we zoom in closer to one of the most interesting regions in that constellation, filled with nebulas and clusters. The prominent red arc is the Seagull Nebula, aka IC 2177. Above and to the right of the Seagull is a clump of stars called Messier 50, which lies over the border in the constellation of Monoceros the Unicorn. At the lower left edge of the frame sits a pair of dissimilar star clusters, Messier 46 (the left one) and Messier 47 (the right one). M46 is a dense rich cluster of stars while M47 is brighter but looser and more scattered. Several other non-Messier clusters punctuate the field. This is a great area of sky to explore with binoculars. Just below centre you might see a small green-blue patch. That’s the nebula called Thor’s Helmet, or NGC 2359, a fine telescopic object. 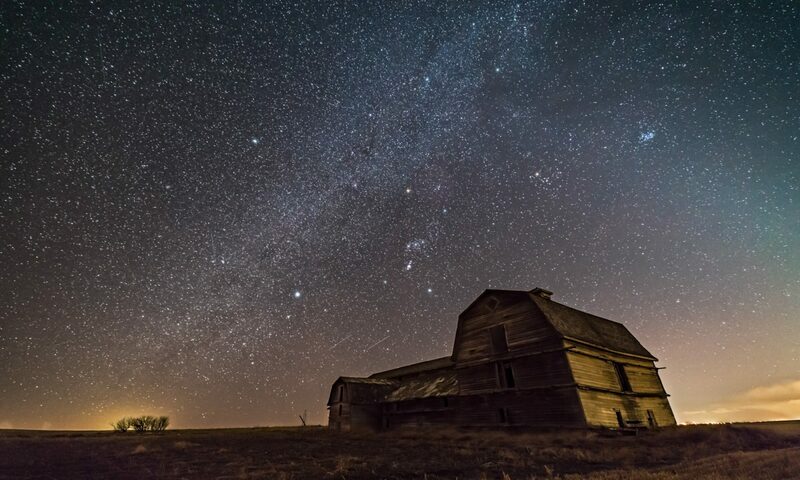 If you get a clear night this season when the Moon is out of the way and you can head to a dark sky, Canis Major, the Hunting Dog, is a great hunting ground for deep-sky fans. As the data at left shows, I shot this with a 135mm telephoto lens, giving a field of view similar to what binoculars would show. That picture is beautiful. This is probably a dumb question, but what is the streak I see from the bottom about 2/3rds over shooting towards the center of the photo? I hope it’s not a satellite “photo bombing” this incredible picture! That is a satellite. I guess I chose not to edit it out.